The Social Security Act of 1935 is the bed rock of this comprehensive effort to build and sustain the safety net. 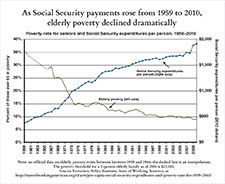 Today (2013) 54 million people receive some form of Social Security benefits. The program is one of the nation’s most effective, successful and popular—an insurance policy—and a pact between generations—that provides economic protection from birth to death. Employees and employers pay a “premium” for comprehensive family insurance (equivalent to a policy worth $500,000) through Social Security taxes (FICA) on weekly earnings. When a working person retires or dies monthly benefits to the worker and the family are based on these previous payments/contributions. Of the 54 million people currently receiving Social Security benefits, 37 million are retirees and their spouses, 8 million are workers with disabilities, 4 million are children who have lost a parent, and 5 million are widows and widowers. Social Security has three revenue sources—payroll contributions from employers and employees, interest earned on Social Security’s U.S. Treasury Bond holdings (in the SS Trust Fund), and income taxes on the Social Security benefits paid to those with higher incomes. The Social Security Trust Fund holds the difference between receipts and expenditures in the social security system. There is currently a surplus of $2.8 trillion. Social Security and its cousin—Medicare—are social insurance programs, providing benefits to those who pay into those programs. Both programs can be modified, or even eliminated, by a majority vote of both houses of congress and signed by the president. Some conservatives incorrectly view any payments paid to individuals by the government as “entitlement” programs, whether recipients have paid into the program or not. 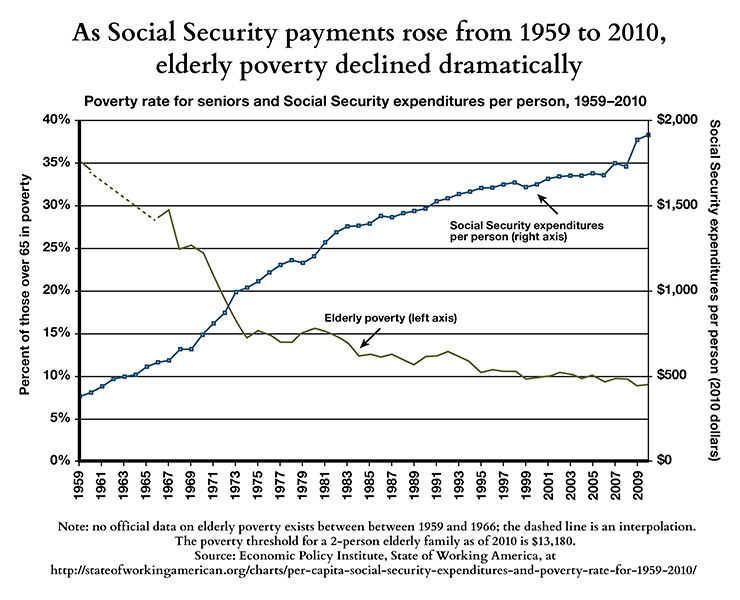 Social Security did not cause and is unrelated to the federal deficit. Tax give-aways are the costliest benefits the government provides. 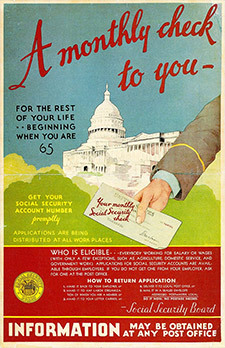 Social Security is a self-sustaining program is funded by payments from the Social Security Trust Fund and does not use general tax revenues to pay benefits. It works for most people. It can pay full benefits through 2032 without any changes. Modest changes will guarantee its existence for the next 75 years. 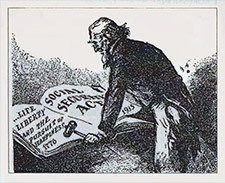 Some suggestions include raising the retirement age (thus cutting benefits for future retirees), reducing the annual Cost of Living Adjustment (COLA) (no longer fully protecting against inflation), price indexing (thereby disconnecting the benefit formula from wages and connecting it to prices), and means testing (making Social Security a welfare program rather than a benefit program). Alternative suggestions for dealing with anticipated shortfalls include lifting the cap on wages subject to FICA deductions (currently $113,700), dedicating the estate tax to Social Security, and increasing the FICA tax by 1% to insure long term solvency.